Women (and men) are no strangers to the standards that the beauty industry loves to set. These standards change over time, as some periods will favor less makeup and a certain type of facial feature while another may favor an entirely different look. Today, we have a melting pot of different standards that come together to form one seemingly impossible-to-attain look. Long and healthy eyelashes are one of those difficult features to attain, but there are actually some natural substances that can help you do so. Castor oil is one of the most popular vegetable oils, outside of the main ones you use for cooking every day. Castor oil is typically cold pressed from the seeds of the Ricinus communis plant. This plant originates in the tropical areas of Asia and Africa. You may be most familiar with this oil for its frequent use as a natural laxative, but it actually can provide a good amount of health benefits for hair and skin as well. The oil is translucent and has a slight yellow tint to it. It is commonly used in many household items from cleaning products to paints, but don’t let that scare you away. Traditionally, it was used as a treatment for various different medical conditions, especially for the treatment of digestive issues. When castor oil is consumed, it breaks down in the small intestine and turns into ricinoleic acid, which helps speed up the digestive process. Not many studies have been done on the oil’s benefits for the hair and face, but that doesn’t take away from what history and countless numbers of testimonials have told us. As far as benefits for the skin go, it’s thought that the oil and the ricinoleic acid can speed up the process of absorbing substances into the skin. It can also sometimes be used in treatments for skin conditions such as dermatitis, psoriasis, acne, and eczema. Throughout history, castor oil has been used for many purposes, both medicinal and cosmetic. The ancient Egyptians were some of the first people noted to have used the oil, and it was especially popular with Cleopatra, who used the oil as an ointment for wounds and as fuel for torches and lamps. The oil has strong antioxidant and anti-inflammatory properties. On top of being a laxative, the oil is also cathartic, which means that it has been known to provide many psychological benefits. The moisturizing properties found in castor oil, as well as its speculated ability to promote hair growth, make it a great oil to be used as a treatment for eyelashes. There are actually two different types of castor oil that are used in beauty products and practices, one being traditional cold-pressed castor oil and the other being Jamaican black castor oil. Beauty products are generally more likely to use Jamaican black castor oil, even though the two oil types have essentially the same properties and provide the same benefits. When it comes to the specific use of castor oil to help promote eyelash health and hair growth, there haven’t actually been any specific studies to prove that the use is successful in any way. With that said, the nutrients that are known to be found in both types of castor oil are known to have some effect on hair growth. For example, some studies have shown that ricinoleic acid, which is the primary nutrient found in castor oil, can help reverse hair loss. It is thought that the fatty acid might fight the protein known as prostaglandin D2 (PGD2), which can be a strong contributing factor to male pattern baldness. Although specific studies have not necessarily been done on the benefits of castor oil for eyelash health, some expert scientists have spoken on the subject. Dr. Lancer, who is the dermatologist for celebrities such as Kim Kardashian West and Beyonce, claims that while castor oil likely has no effect on the growth of the lashes, it may help prevent premature breakage and damage to the lashes thanks to its moisturizing and conditioning properties. By nourishing your lashes and preventing premature breakage or damage, you can help them appear fuller and longer, which imitates the appearance of a lash growth effect. When it comes to using castor oil for your eyelashes, however, it is important that you be very careful if you do choose to apply the oil to your lashes. It’s generally recommended that you not apply any products, oils, or substances around your eyes, as you could risk getting something directly in your eye. Applying an oil to your eyelashes is no different. If you are interested in using castor oil for any cosmetic reason, you should make sure that you buy the right stuff. Before buying your castor oil, read the label carefully to ensure that you are getting pure castor oil. If the oil has been combined with other ingredients or oil, it could cause irritation and is unlikely to be effective in any case. When it comes to beauty, there are actually two varieties of castor oil that are used. The first type is the clear-colored, cold-pressed variety of castor oil. The other type is the darker colored Jamaican black castor oil. The Jamaican variety has recently become the preferred choice when it comes to cosmetic treatments. However, both types contain the same medicinal properties which might make them a useful treatment for eyelash growth. Before treating your eyelashes with castor oil, you should perform a patch test to make sure you are not sensitive to the oil. Dab a little of your oil on a discrete area of your skin such as the inside of your arm. If your skin does not react, then you should be good to apply it to your eyelashes. According to people who have had success with castor oil, it is best to perform this treatment before going to bed. First of all, your eyelashes should be completely clean and free of any makeup. Dip a cotton swab in your castor oil. Gently run the swab along the tops of your eyelashes making sure that you do not get any into your eyes. (castor oil can irritate the eyes badly – if you get any into your eyes, wash it out immediately with clean water. Leave the oil on overnight and wash it out thoroughly the next morning. Repeat the treatment several times a week until you get the desired results. Does Research Support the Use of Castor Oil for Eyelash Growth? Unfortunately, there are no scientific studies to prove that castor oil can boost the growth of eyelashes and we are reliant largely on anecdotal evidence that it is effective. This mechanism may explain why many people have found castor oil to be effective on eyelash growth but more studies are necessary to prove that it works on other types of hair. A comedogenic rating is a score that is given to natural substances to determine how likely they are to irritate the skin, clog a person’s pores, or worsen the presence of any skin conditions such as acne. The scores are given on a scale that ranges from zero to five, and the lowest numbers represent the substances that are least likely to cause any negative reactions. With that said, people may often experience reactions that are different from what the ratings may suggest. Castor oil has been given a comedogenic rating of one, which means that it should be safe for most people to use on their skin. With that said, some people have noted that the oil dries their skin out, so people who have particularly dry skin already may not do well with the application of castor oil. Because of its composition, castor oil should only be used on the skin when diluted with another carrier oil to lessen its drying effects. As mentioned, castor oil is a very powerful natural laxative, which is what the substance is most often used for today. The oil is a stimulant laxative, which means that it works by stimulating and promoting movement within the muscle to push materials through the intestines, thus clearing out the bowels. This normally occurs very quickly, which makes it a great treatment option that provides quick relief. Studies have shown that the use of castor oil in elderly patients has helped ease symptoms of constipation. For the skin, castor oil is also a great moisturizer, thanks to its high concentration of ricinoleic acid, which is a healthy, monounsaturated fatty acid that is commonly used as a humectant and moisturizer for the skin. This means that the oil is good for helping the skin retain and lock in moisture without losing any water through the outermost layer of the skin. These cosmetic benefits have made it so that castor oil is a very popular added ingredient in many products, including lotions, cleansers, and makeup. Castor oil is normally mixed with other carrier oils such as almond oil, olive oil, or coconut oil to increase its moisturizing benefits and make it more suitable for all skin types. Like several other popular natural oils, castor oil may also be used to help promote quicker and more efficient healing of wounds. It is often combined with Peru balsam, which is a balm that comes from the Myroxylon tree, to produce a popular ointment called Venelex for this purpose. There have also been studies done that show a connection between castor oil and the stimulation of tissue and cell growth. This can help wounds rebuild and reduce the risk of infection. Another popular use of castor oil is appreciated by people who suffer from frequent acne breakouts. 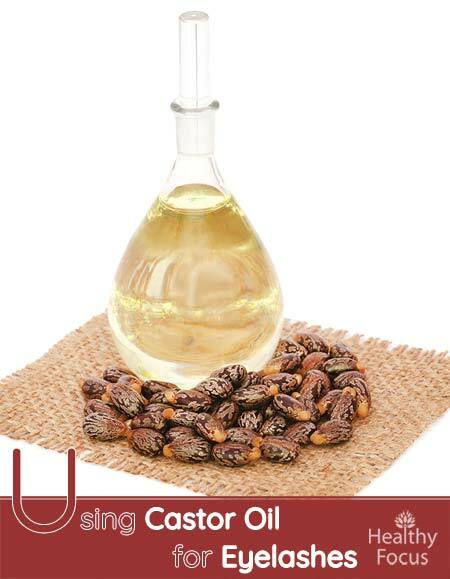 There are many properties and qualities in castor oil that can help relieve the symptoms of acne. The anti-inflammatory and antimicrobial properties of the oil can help relieve symptoms related to inflammation and fight different types of bacteria that contribute to breakouts. The oil’s natural moisturizing properties also help treat and relieve acne. The answer is maybe. There have been no studies into the effects of castor oil on eyelash growth but studies have demonstrated that castor oil can prevent hair loss and boost regrowth. When it comes to its effectiveness on eyelash growth, we are reliant on anecdotal evidence. Is castor oil safe for your eyes? For most people, it is safe to apply castor oil to the eyelashes but some people may be allergic. You should always perform a patch test to make sure that you are not sensitive before applying a larger dose. You must be very careful not to get castor oil into the eyes themselves. Castor oil can irritate the eyes badly. If you get any of the oil into your eyes, immediately wash them out with water. How long does it take for castor oil to work on eyebrows? If anecdotal evidence is to be believed, it takes two or three months before you start seeing real effects. Studies have showed that it takes around 6 months for hair to regrow with castor oil but there are no studies into its effects on eyelashes. Factors such as age group and health may affect the time scale. Over-consumption of castor oil may cause users to experience cramps, vomiting, diarrhea, and feelings of nausea. Because of this, it’s recommended only as a form of treatment for occasional constipation and not for any conditions that have been diagnosed as long-term. Some studies have also shown that people may experience allergic reactions to using castor oil, including the breakouts, rashes, swelling, and itching. To avoid having a severe allergic reaction, it’s advised that you first perform a small patch test on your arm to determine how your skin will react to the castor oil. Overall, it seems like the verdict is inconclusive regarding whether or not castor oil can actually help your eyelashes. Some experts have said that the oil does provide some benefits, but there may not be strong enough evidence to risk getting oil in your eye during the application process. If you choose a pure, organic version of castor oil and are incredibly careful when applying it to your lashes, it’s likely that you will notice some benefits, whether it be immediately or over time. It is also speculated that the eyelash fullness produced is an illusion provided by the viscosity of the oil. Have you ever used castor oil or any other home remedy to try and stimulate eyelash growth? Please let us know what you thought of the effects and whether or not you would recommend it as a natural treatment.